You lucky guys in London seem to have been hogging Busaba for aaaaaaages. So when I heard they were opening one in Manchester, I was more than a little keen to try it out for myself. I know I’m a little late on the Busaba bandwagon, but please do humour me. 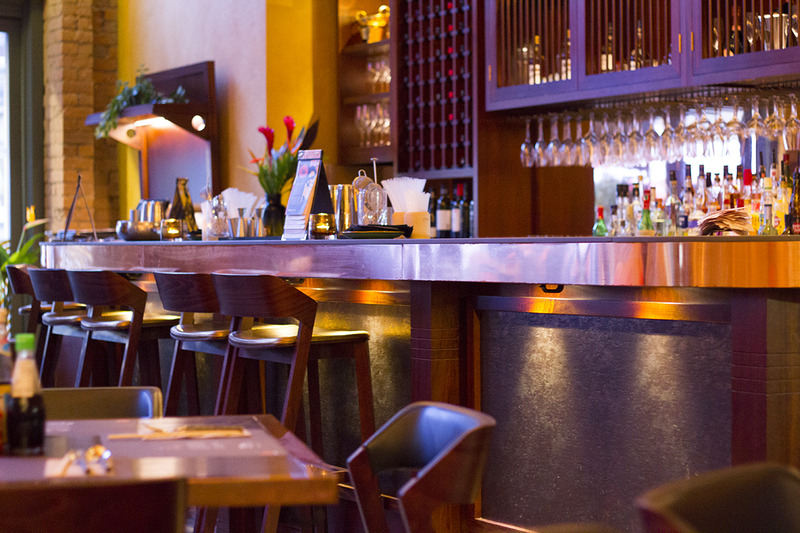 Located in the former Cafe Rouge in the Printworks, Busaba Eathai has some stiff competition from its surrounding fellow Asian chain restaurants, Tampopo and Wagamama. 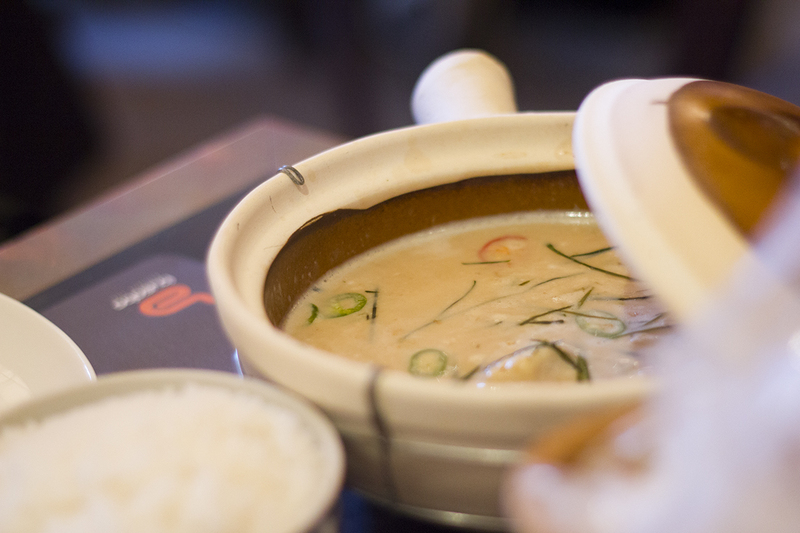 I’ve sung my praises for Tampopo before, so I was interested to see if a solely Thai restaurant would triumph over the amazing Thai food they serve up at Tampopo. I grabbed fellow foodie friend, Ros (who now blogs at Majella Rose, check it out!! 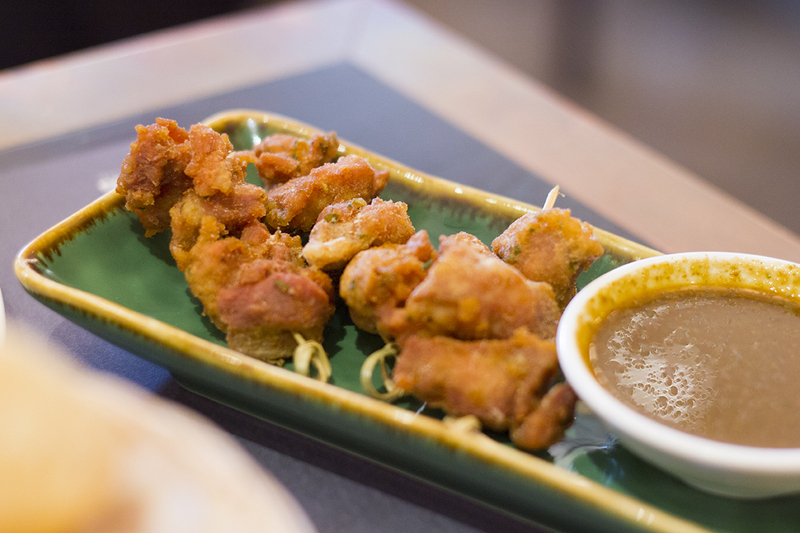 ), so we could both sample the Busaba menu and see if it lived up to its London hype. You can’t start off your Thai meal without prawn crackers. Not the horrible white kind you get chucked into your greasy Chinese takeaway, these have much more substance and don’t stick to your tongue. 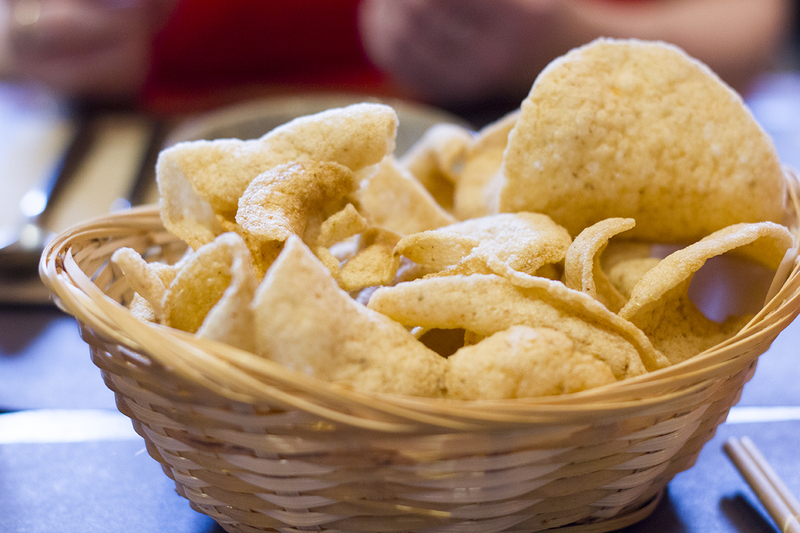 Busaba’s prawn crackers (£2.50) are moreish, crunchy, sometimes huge and perfect with some sweet chilli sauce. We can’t be friends if you don’t get a basket of these while you’re deciding on which dishes to eat. As for drinks, Ros went for a classy Bottle Green elderflower and pomegranate presse, which looked delightfully refreshing on what was quite a humid day. I had to try a cocktail in the interests of this review (…ahem) so I went for a Bangkok Mule. It was a bit of a strange one at first, as all I could think about was the coriander they’d used in it. But after a few sips and then moving on to my second, I decided that I quite liked it. 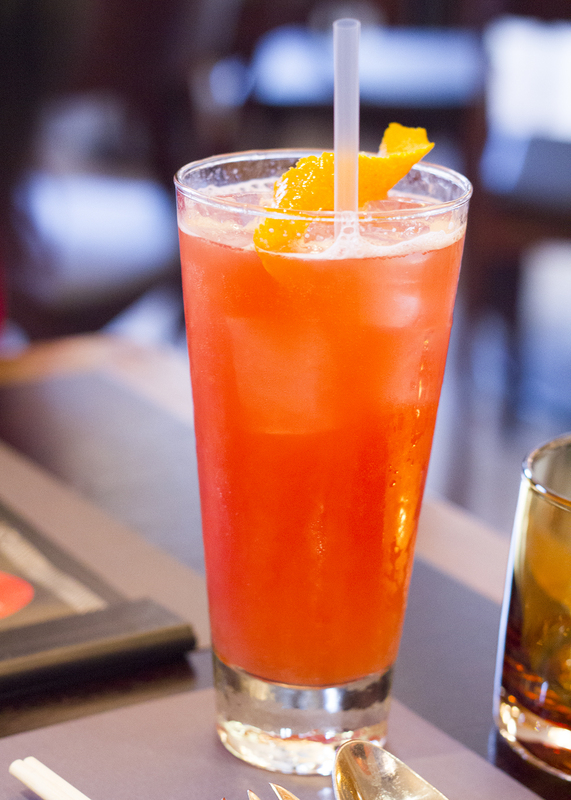 The hibiscus infused gin, aperol, ginger beer, lime and pineapple juice were a great combo! We deliberated over our dishes for absolutely ages. I’m sure the guy was starting to think we might be a bit dim. Eventually though, I decided I needed to go for the Thai Calamari (£6.95), which I’d heard lots of great things about. It landed on the table looking a bit questionable, particularly with those green peppercorns, but it was definitely a standout dish for me. The calamari was cooked to perfection with absolutely no rubbery chewiness and the sauce complimented it beautifully. Ros had a slightly less enjoyable dish. To be fair, she should’ve know not to get fried chicken in a Thai restaurant, but it was still a disappointment. They were a sort of fried chicken lollipop, but unfortunately cooked a little too much and ended up being quite dry. The sauce wasn’t great either, so she ended up dipping them in the sweet chilli sauce instead! Let’s start with the Thai Roti (£2.50) because it was just excellent. I forget how much I love roti until I order it. It’s kind of like naan bread but less doughy and slightly more like pastry. Oh and the best bit? Our mains weren’t the best for some roti dipping action, so the waiter brought us a bowl of Thai red curry and Thai green curry just for dipping. DREAMY. 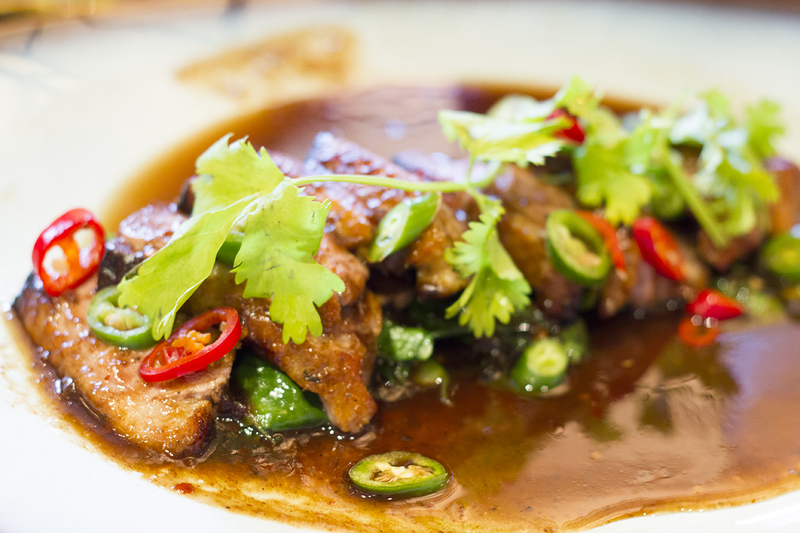 For my main, I went for the Chargrilled Duck Breast (£14.95) which is served with sticky rice, Chinese broccoli and tamarind sauce. The duck breast was sliced into little medallions and cooked so perfectly, with a little pinkness in the middle. That being said, I found the tamarind sauce to be slightly too strong for my taste. It kind of overpowered the beautiful flavour of the duck, sadly. Ros went for a vegetarian dish this time, choosing the Coconut and Vegeatable Hot Pot (£11.95), which was served with jasmine rice. Soups are usually served with noodles, so it was a pleasant surprise to see this one come with rice. Although it was a gigantic portion and it had quite a distinct coconut flavour, this seemed to go down really well with her! A surprise new favourite, I think. You know the drill by now. I can never resist the lure of the dessert menu, even when I’m “SO FULL I COULD ACTUALLY BURST”. Naturally I gravitated towards a chocolatey dessert and I wasn’t disappointed. 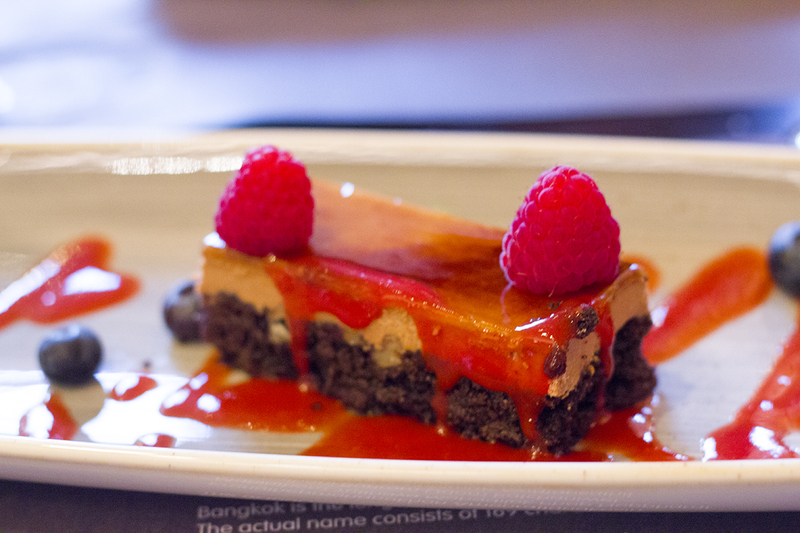 The Salted Caramel Chocolate Slice (£6.50) is served up with strawberry coulis and fresh rapsberries and blueberries. It’s not the best chocolate dessert I’ve had, but let’s be real, I’ve had many. The salted caramel part is fudgey and adds an extra bit of decadence to the dessert, although I definitely think it could be saltier. I’m not about salted caramel things that aren’t even a little teeny bit salted. 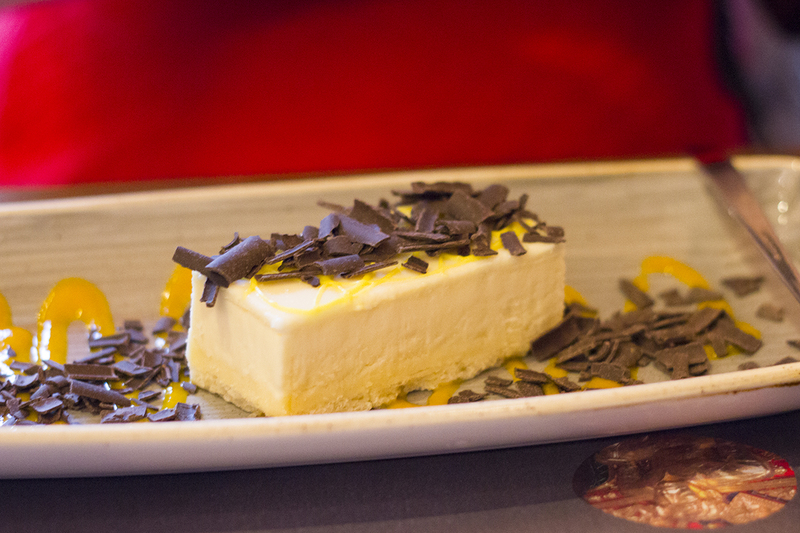 Ros had my second favourite option on the menu, the Lemon Cheesecake (£5.95), which looked amazing! It was served with a tangy lemon coulis and dark chocolate shavings and since we didn’t share each other’s desserts, I can only assume it tasted great. Honestly? 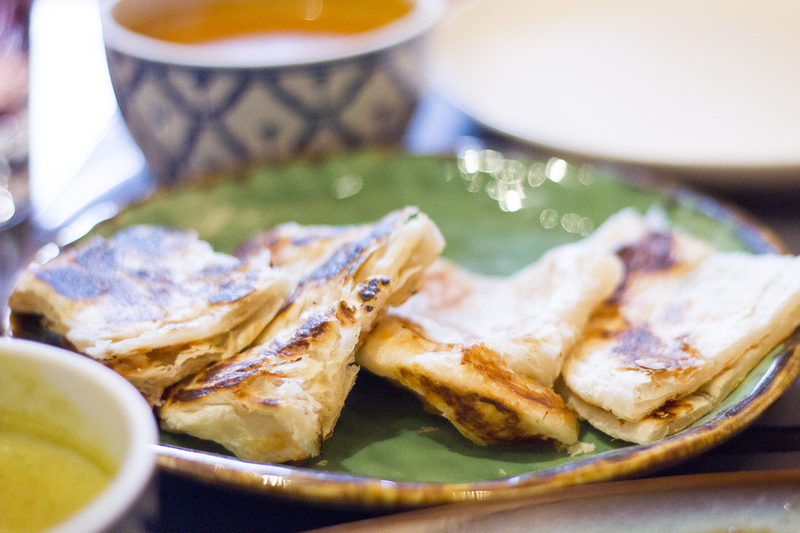 I wasn’t blown away by Busaba. I think I’d definitely go back to try some more dishes, but it’s not going to be my new go-to Thai restaurant. The quality of ingredients is great, but I think they occasionally miss the mark when it comes to the flavourings of the dishes. As they’re still quite new to Manchester though, I’m confident they’ll iron out the creases and become a real asset to the revived Printworks complex. If you’d like to read more of my restaurant reviews, check out my ‘Food’ section where I cover lots of amazing Manchester restaurants. 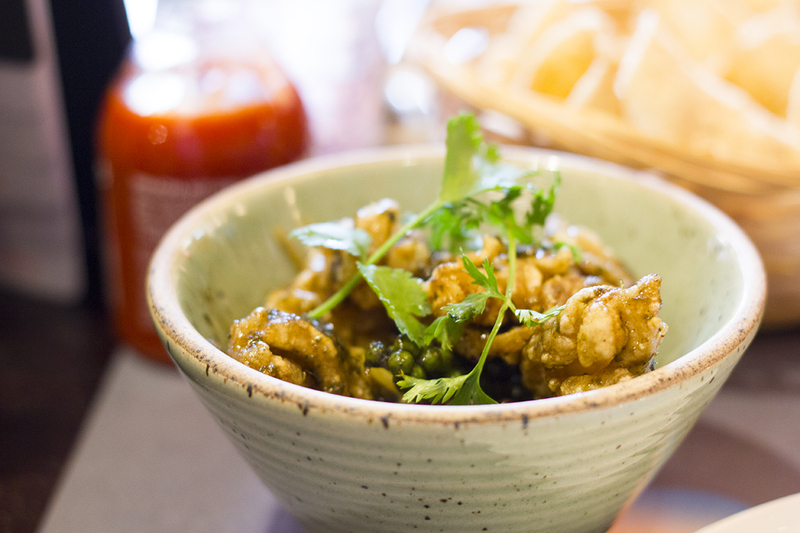 You can find your nearest Busabab Eathai on their website here. Disclaimer: Our food was complimentary of Busaba Eathai but as always, all thoughts & opinions are my very own. 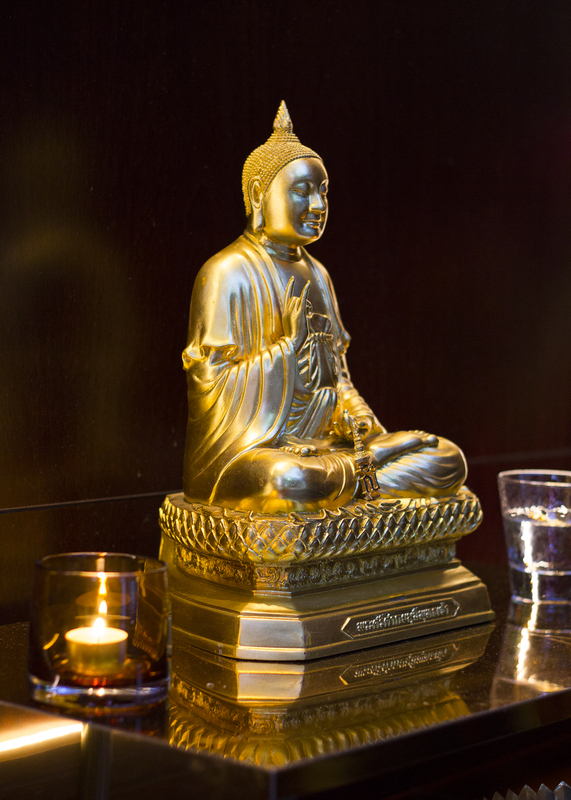 Have you visited Busaba yet? What are your favourite dishes?